Plant breeding is the science of changing the traits of plants in order to produce desired characteristics. It has been used to improve the quality of nutrition in products for humans and animals. 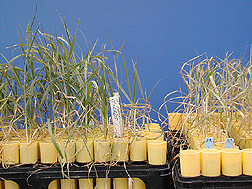 Plant breeding can be accomplished through many different techniques ranging from simply selecting plants with desirable characteristics for propagation, to methods that make use of knowledge of genetics and chromosomes, to more complex molecular techniques (see cultigen and cultivar). Genes in a plant are what determine what type of qualitative or quantitative traits it will have. Plant breeders strive to create a specific outcome of plants and potentially new plant varieties. Plant breeding has been practiced for thousands of years, since near the beginning of human civilization. It is practiced worldwide by individuals such as gardeners and farmers, and by professional plant breeders employed by organizations such as government institutions, universities, crop-specific industry associations or research centers. International development agencies believe that breeding new crops is important for ensuring food security by developing new varieties that are higher yielding, disease resistant, drought tolerant or regionally adapted to different environments and growing conditions. Plant breeding started with sedentary agriculture and particularly the domestication of the first agricultural plants, a practice which is estimated to date back 9,000 to 11,000 years. Initially early farmers simply selected food plants with particular desirable characteristics, and employed these as progenitors for subsequent generations, resulting in an accumulation of valuable traits over time. Grafting technology had been practiced in China before 2000 BCE. Gregor Mendel (1822–84) is considered the "father of modern genetics". His experiments with plant hybridization led to his establishing laws of inheritance. Genetics stimulated research to improve crop production through plant breeding. Modern plant breeding is applied genetics, but its scientific basis is broader, covering molecular biology, cytology, systematics, physiology, pathology, entomology, chemistry, and statistics (biometrics). It has also developed its own technology. For the role of crossing and plant breeding in viticulture, see Propagation of grapevines. One major technique of plant breeding is selection, the process of selectively propagating plants with desirable characteristics and eliminating or "culling" those with less desirable characteristics. Another technique is the deliberate interbreeding (crossing) of closely or distantly related individuals to produce new crop varieties or lines with desirable properties. Plants are crossbred to introduce traits/genes from one variety or line into a new genetic background. For example, a mildew-resistant pea may be crossed with a high-yielding but susceptible pea, the goal of the cross being to introduce mildew resistance without losing the high-yield characteristics. Progeny from the cross would then be crossed with the high-yielding parent to ensure that the progeny were most like the high-yielding parent, (backcrossing). The progeny from that cross would then be tested for yield (selection, as described above) and mildew resistance and high-yielding resistant plants would be further developed. Plants may also be crossed with themselves to produce inbred varieties for breeding. Pollinators may be excluded through the use of pollination bags. Successful commercial plant breeding concerns were founded from the late 19th century. [clarification needed] Gartons Agricultural Plant Breeders in England was established in the 1890s by John Garton, who was one of the first to commercialize new varieties of agricultural crops created through cross-pollination. The firm's first introduction was Abundance Oat, one of the first agricultural grain varieties bred from a controlled cross, introduced to commerce in 1892. In the early 20th century, plant breeders realized that Mendel's findings on the non-random nature of inheritance could be applied to seedling populations produced through deliberate pollinations to predict the frequencies of different types. Wheat hybrids were bred to increase the crop production of Italy during the so-called "Battle for Grain" (1925–1940). Heterosis was explained by George Harrison Shull. It describes the tendency of the progeny of a specific cross to outperform both parents. The detection of the usefulness of heterosis for plant breeding has led to the development of inbred lines that reveal a heterotic yield advantage when they are crossed. Maize was the first species where heterosis was widely used to produce hybrids. Statistical methods were also developed to analyze gene action and distinguish heritable variation from variation caused by environment. In 1933 another important breeding technique, cytoplasmic male sterility (CMS), developed in maize, was described by Marcus Morton Rhoades. CMS is a maternally inherited trait that makes the plant produce sterile pollen. This enables the production of hybrids without the need for labor-intensive detasseling. Following World War II a number of techniques were developed that allowed plant breeders to hybridize distantly related species, and artificially induce genetic diversity. When distantly related species are crossed, plant breeders make use of a number of plant tissue culture techniques to produce progeny from otherwise fruitless mating. Interspecific and intergeneric hybrids are produced from a cross of related species or genera that do not normally sexually reproduce with each other. These crosses are referred to as Wide crosses. For example, the cereal triticale is a wheat and rye hybrid. The cells in the plants derived from the first generation created from the cross contained an uneven number of chromosomes and as result was sterile. The cell division inhibitor colchicine was used to double the number of chromosomes in the cell and thus allow the production of a fertile line. Failure to produce a hybrid may be due to pre- or post-fertilization incompatibility. If fertilization is possible between two species or genera, the hybrid embryo may abort before maturation. If this does occur the embryo resulting from an interspecific or intergeneric cross can sometimes be rescued and cultured to produce a whole plant. Such a method is referred to as Embryo Rescue. This technique has been used to produce new rice for Africa, an interspecific cross of Asian rice (Oryza sativa) and African rice (Oryza glaberrima). Hybrids may also be produced by a technique called protoplast fusion. In this case protoplasts are fused, usually in an electric field. Viable recombinants can be regenerated in culture. Chemical mutagens like EMS and DMS, radiation and transposons are used to generate mutants with desirable traits to be bred with other cultivars – a process known as Mutation Breeding. Classical plant breeders also generate genetic diversity within a species by exploiting a process called somaclonal variation, which occurs in plants produced from tissue culture, particularly plants derived from callus. Induced polyploidy, and the addition or removal of chromosomes using a technique called chromosome engineering may also be used. When a desirable trait has been bred into a species, a number of crosses to the favored parent are made to make the new plant as similar to the favored parent as possible. Returning to the example of the mildew resistant pea being crossed with a high-yielding but susceptible pea, to make the mildew resistant progeny of the cross most like the high-yielding parent, the progeny will be crossed back to that parent for several generations (See backcrossing ). This process removes most of the genetic contribution of the mildew resistant parent. Classical breeding is therefore a cyclical process. With classical breeding techniques, the breeder does not know exactly what genes have been introduced to the new cultivars. Some scientists therefore argue that plants produced by classical breeding methods should undergo the same safety testing regime as genetically modified plants. There have been instances where plants bred using classical techniques have been unsuitable for human consumption, for example the poison solanine was unintentionally increased to unacceptable levels in certain varieties of potato through plant breeding. New potato varieties are often screened for solanine levels before reaching the marketplace. 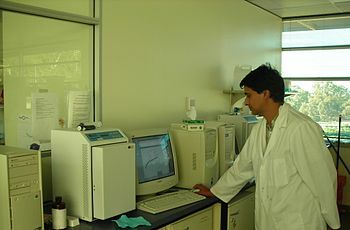 Modern plant breeding may use techniques of molecular biology to select, or in the case of genetic modification, to insert, desirable traits into plants. Application of biotechnology or molecular biology is also known as molecular breeding. Sometimes many different genes can influence a desirable trait in plant breeding. The use of tools such as molecular markers or DNA fingerprinting can map thousands of genes. This allows plant breeders to screen large populations of plants for those that possess the trait of interest. The screening is based on the presence or absence of a certain gene as determined by laboratory procedures, rather than on the visual identification of the expressed trait in the plant. The purpose of marker assisted selection, or plant genomes analysis, is to identify the location and function (phenotype) of various genes within the genome. If all of the genes are identified it leads to Genome sequence. All plants have varying sizes and lengths of genomes with genes that code for different proteins, but many are also the same. If a gene's location and function is identified in one plant species, a very similar gene likely can also be found in a similar location in another species genome. [clarification needed]Homozygous plants with desirable traits can be produced from heterozygous starting plants, if a haploid cell with the alleles for those traits can be produced, and then used to make a doubled haploid. The doubled haploid will be homozygous for the desired traits. Furthermore, two different homozygous plants created in that way can be used to produce a generation of F1 hybrid plants which have the advantages of heterozygosity and a greater range of possible traits. Thus, an individual heterozygous plant chosen for its desirable characteristics can be converted into a heterozygous variety (F1 hybrid) without the necessity of vegetative reproduction but as the result of the cross of two homozygous/doubled haploid lines derived from the originally selected plant. Using plant tissue culturing can produce haploid or double haploid plant lines and generations. This minimizes the amount of genetic diversity among that plant species in order to select for desirable traits that will increase the fitness of the individuals. Using this method decreases the need for breeding multiple generations of plants to get a generation that is homologous for the desired traits, therefore save much time in the process. 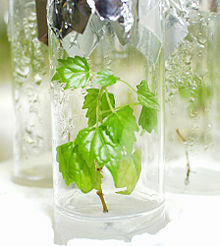 There are many plant tissue culturing techniques that can be used to achieve the haploid plants, but microspore culturing is currently the most promising for producing the largest numbers of them. Genetic modification of plants is achieved by adding a specific gene or genes to a plant, or by knocking down a gene with RNAi, to produce a desirable phenotype. The plants resulting from adding a gene are often referred to as transgenic plants. If for genetic modification genes of the species or of a crossable plant are used under control of their native promoter, then they are called cisgenic plants. Sometimes genetic modification can produce a plant with the desired trait or traits faster than classical breeding because the majority of the plant's genome is not altered. To genetically modify a plant, a genetic construct must be designed so that the gene to be added or removed will be expressed by the plant. To do this, a promoter to drive transcription and a termination sequence to stop transcription of the new gene, and the gene or genes of interest must be introduced to the plant. A marker for the selection of transformed plants is also included. In the laboratory, antibiotic resistance is a commonly used marker: Plants that have been successfully transformed will grow on media containing antibiotics; plants that have not been transformed will die. In some instances markers for selection are removed by backcrossing with the parent plant prior to commercial release. The construct can be inserted in the plant genome by genetic recombination using the bacteria Agrobacterium tumefaciens or A. rhizogenes, or by direct methods like the gene gun or microinjection. Using plant viruses to insert genetic constructs into plants is also a possibility, but the technique is limited by the host range of the virus. For example, Cauliflower mosaic virus (CaMV) only infects cauliflower and related species. Another limitation of viral vectors is that the virus is not usually passed on the progeny, so every plant has to be inoculated. Genetic modification of plants that can produce pharmaceuticals (and industrial chemicals), sometimes called pharming, is a rather radical new area of plant breeding. Modern plant breeding, whether classical or through genetic engineering, comes with issues of concern, particularly with regard to food crops. The question of whether breeding can have a negative effect on nutritional value is central in this respect. Although relatively little direct research in this area has been done, there are scientific indications that, by favoring certain aspects of a plant's development, other aspects may be retarded. A study published in the Journal of the American College of Nutrition in 2004, entitled Changes in USDA Food Composition Data for 43 Garden Crops, 1950 to 1999, compared nutritional analysis of vegetables done in 1950 and in 1999, and found substantial decreases in six of 13 nutrients measured, including 6% of protein and 38% of riboflavin. Reductions in calcium, phosphorus, iron and ascorbic acid were also found. The study, conducted at the Biochemical Institute, University of Texas at Austin, concluded in summary: "We suggest that any real declines are generally most easily explained by changes in cultivated varieties between 1950 and 1999, in which there may be trade-offs between yield and nutrient content." The debate surrounding genetically modified food during the 1990s peaked in 1999 in terms of media coverage and risk perception, and continues today – for example, "Germany has thrown its weight behind a growing European mutiny over genetically modified crops by banning the planting of a widely grown pest-resistant corn variety." The debate encompasses the ecological impact of genetically modified plants, the safety of genetically modified food and concepts used for safety evaluation like substantial equivalence. Such concerns are not new to plant breeding. Most countries have regulatory processes in place to help ensure that new crop varieties entering the marketplace are both safe and meet farmers' needs. Examples include variety registration, seed schemes, regulatory authorizations for GM plants, etc. Plant breeders' rights is also a major and controversial issue. Today, production of new varieties is dominated by commercial plant breeders, who seek to protect their work and collect royalties through national and international agreements based in intellectual property rights. The range of related issues is complex. In the simplest terms, critics of the increasingly restrictive regulations argue that, through a combination of technical and economic pressures, commercial breeders are reducing biodiversity and significantly constraining individuals (such as farmers) from developing and trading seed on a regional level. Efforts to strengthen breeders' rights, for example, by lengthening periods of variety protection, are ongoing. Currently, few breeding programs are directed at organic agriculture and until recently those that did address this sector have generally relied on indirect selection (i.e. selection in conventional environments for traits considered important for organic agriculture). However, because the difference between organic and conventional environments is large, a given genotype may perform very differently in each environment due to an interaction between genes and the environment (see gene-environment interaction). If this interaction is severe enough, an important trait required for the organic environment may not be revealed in the conventional environment, which can result in the selection of poorly adapted individuals. To ensure the most adapted varieties are identified, advocates of organic breeding now promote the use of direct selection (i.e. selection in the target environment) for many agronomic traits. There are many classical and modern breeding techniques that can be utilized for crop improvement in organic agriculture despite the ban on genetically modified organisms. For instance, controlled crosses between individuals allow desirable genetic variation to be recombined and transferred to seed progeny via natural processes. Marker assisted selection can also be employed as a diagnostics tool to facilitate selection of progeny who possess the desired trait(s), greatly speeding up the breeding process. This technique has proven particularly useful for the introgression of resistance genes into new backgrounds, as well as the efficient selection of many resistance genes pyramided into a single individual. Unfortunately, molecular markers are not currently available for many important traits, especially complex ones controlled by many genes. For future agriculture to thrive there are necessary changes which must be made in accordance to arising global issues. These issues are arable land, harsh cropping conditions and food security which involves, being able to provide the world population with food containing sufficient nutrients. These crops need to be able to mature in several environments allowing for worldwide access, this is involves issues such as drought tolerance. These global issues are achievable through the process of plant breeding, as it offers the ability to select specific genes allowing the crop to perform at a level which yields the desired results. With an increasing population, the production of food needs to increase with it. It is estimated that a 70% increase in food production is needed by 2050 in order to meet the Declaration of the World Summit on Food Security. But with the degradation of agricultural land, simply planting more crops is no longer a viable option. New varieties of plants can in some cases be developed through plant breeding that generate an increase of yield without relying on an increase in land area. An example of this can be seen in Asia, where food production per capita has increased twofold. This has been achieved through not only the use of fertilisers, but through the use of better crops that have been specifically designed for the area. Plant breeding of hybrid crops has become extremely popular worldwide in an effort to combat the harsh environment. With long periods of drought and lack of water or nitrogen stress tolerance has become a significant part of agriculture. Plant breeders have focused on identifying crops which will ensure crops perform under these conditions; a way to achieve this is finding strains of the crop that is resistance to drought conditions with low nitrogen. It is evident from this that plant breeding is vital for future agriculture to survive as it enables farmers to produce stress resistant crops hence improving food security. In countries that experience harsh winters such as Iceland, Germany and further east in Europe, plant breeders are involved in breeding for tolerance to frost, continuous snow-cover, frost-drought (desiccation from wind and solar radiation under frost) and high moisture levels in soil in winter. Participatory plant breeding (PPB) is when farmers are involved in a crop improvement programme with opportunities to make decisions and contribute to the research process at different stages. Participatory approaches to crop improvement can also be applied when plant biotechnologies are being used for crop improvement. Local agricultural systems and genetic diversity are developed and strengthened by crop improvement, which participatory crop improvement (PCI) plays a large role. PPB is enhanced by farmers knowledge of the quality required and evaluation of target environment which affects the effectiveness of PPB. Mentor pollen, inactivated pollen that is compatible with the female plant is mixed with pollen that would normally be incompatible. The mentor pollen has the effect of guiding the foreign pollen to the ovules. S1 generation, the product of self-fertilization. ^ a b Hartung, Frank; Schiemann, Joachim (2014). "Precise plant breeding using new genome editing techniques: opportunities, safety and regulation in the EU". The Plant Journal. 78 (5): 742–752. doi:10.1111/tpj.12413. PMID 24330272. ^ Piperno, D. R.; Ranere, A. J.; Holst, I.; Iriarte, J.; Dickau, R. (2009). "Starch grain and phytolith evidence for early ninth millennium B.P. maize from the Central Balsas River Valley, Mexico". PNAS. 106 (13): 5019–5024. doi:10.1073/pnas.0812525106. PMC 2664021. PMID 19307570. ^ Meng, Chao; Xu, Dong; Son, Young-Jun & Kubota, Chieri (2012). "Simulation-based Economic Feasibility Analysis of Grafting Technology for Propagation Operation". In Lim, G. & Herrmann, J.W. (eds.). Proceedings of the 2012 Industrial and Systems Engineering Research Conference. IIE Annual Conference. Norcross: Institute of Industrial Engineers. ^ Mudge, K.; Janick, J.; Scofield, S.; Goldschmidt, E. (2009). A History of Grafting (PDF). Horticultural Reviews. 35. pp. 449–475. doi:10.1002/9780470593776.ch9. ISBN 9780470593776. ^ "Plant breeding". Archived from the original on 2013-10-21. ^ Noel Kingsbury (2009). Hybrid: The History and Science of Plant Breeding. University of Chicago Press. p. 140. ISBN 9780226437057. ^ a b Kasha, Ken (1999). "Biotechnology and world food supply". Genome. 42 (4): 642–645. doi:10.1139/g99-043. ^ Moreland, D E (1980). "Mechanisms of Action of Herbicides". Annual Review of Plant Physiology. 31 (1): 597–638. doi:10.1146/annurev.pp.31.060180.003121. ^ Suzie Key; Julian K-C Ma & Pascal MW Drake (1 June 2008). "Genetically modified plants and human health". Journal of the Royal Society of Medicine. 101 (6): 290–298. doi:10.1258/jrsm.2008.070372. PMC 2408621. PMID 18515776. ^ Davis, D.R. ; Epp, M.D. ; Riordan, H.D. (2004). "Changes in USDA Food Composition Data for 43 Garden Crops, 1950 to 1999". Journal of the American College of Nutrition. 23 (6): 669–682. doi:10.1080/07315724.2004.10719409. ^ Costa-Font, J.; Mossialos, E. (2007). "Are perceptions of 'risks' and 'benefits' of genetically modified food (in)dependent?". Food Quality and Preference. 18 (2): 173–182. doi:10.1016/j.foodqual.2005.09.013. ^ Connoly, Kate (2009-04-14). "Germany deals blow to GM crops". The Guardian. Retrieved 2009-06-25. ^ Luby, C. H.; Kloppenburg, J.; Michaels, T. E.; Goldman, I. L. (2015). "Enhancing Freedom to Operate for Plant Breeders and Farmers through Open Source Plant Breeding". Crop Science. 55 (6): 2481–2488. doi:10.2135/cropsci2014.10.0708 – via ACSESS Digital Library. ^ a b Murphy, Kevin M.; K.G. Campbell; S.R. Lyon; S.S. Jones (2007). "Evidence of varietal adaptation to organic farming systems". Field Crops Research. 102 (3): 172–177. doi:10.1016/j.fcr.2007.03.011. ^ a b c Lammerts van Bueren, E.T. ; S.S. Jones; L. Tamm; K.M. Murphy; J.R. Myers; C. Leifert; M.M. Messmer (2010). "The need to breed crop varieties suitable for organic farming, using wheat, tomato and broccoli as examples: A review". NJAS- Wageningen Journal of Life Sciences. 58 (3–4): 193–205. doi:10.1016/j.njas.2010.04.001. ^ Lammerts van Bueren, E. T.; G. Backes; H. de Vriend; H. Ostergard (2010). "The role of molecular markers and marker assisted selection in breeding for organic agriculture". Euphytica. 175: 51–64. doi:10.1007/s10681-010-0169-0. ^ Tester, Mark; Langridge, Peter (February 2010). "Breeding technologies to increase crop production in a changing world". Science. 327 (5967): 818–822. doi:10.1126/science.1183700. PMID 20150489. ^ Haddad, Lawrence; Godfray, H. Charles J.; Beddington, John R.; Crute, Ian R.; Lawrence, David; Muir, James F.; Pretty, Jules; Robinson, Sherman; Thomas, Sandy M.; Toulmin, Camilla (12 February 2010). "Food security: the challenge of feeding 9 billion people". Science. 327 (5967): 812–818. doi:10.1126/science.1185383. PMID 20110467. ^ Casler, Vogal, M.K. (January–February 1999). "Accomplishments and impact from breeding for increased forage nutritional value". Crop Science. 39 (1): 12–20. doi:10.2135/cropsci1999.0011183x003900010003x. ^ "PRGA Program". PRGA Program. ^ Thro A & Spillane C (2000). "Biotechnology-assisted Participatory Plant Breeding: Complement or Contradiction?" (PDF). CGIAR Systemwide Program on Participatory Research and Gender Analysis for Technology Development and Institutional Innovation. Working Document No. 4 April 2000: 140. ^ Elings, A.; Almekinders, C. J. M.; Stam, P. (December 2001). "Introduction: Why focus thinking on participatory plant breeding". Euphytica. 122 (3): 423–424. doi:10.1023/A:1017923423714. McCouch, S. (2004). "Diversifying Selection in Plant Breeding". PLoS Biol. 2 (10): e347. doi:10.1371/journal.pbio.0020347. PMC 521731. PMID 15486582. Briggs, F.N. and Knowles, P.F. 1967. Introduction to Plant Breeding. Reinhold Publishing Corporation, New York. Curry, Helen Anne. Evolution Made to Order: Plant Breeding and Technological Innovation in Twentieth-Century America (U of Chicago Press, 2016). x, 285 pp. Gepts, P. (2002). "A Comparison between Crop Domestication, Classical Plant Breeding, and Genetic Engineering". Crop Science. 42 (6): 1780–1790. doi:10.2135/cropsci2002.1780. Schouten, Henk J.; Krens, Frans A.; Jacobsen, Evert (2006). "Do cisgenic plants warrant less stringent oversight?". Nature Biotechnology. 24 (7): 753. doi:10.1038/nbt0706-753. PMID 16841052. Schouten, Henk J.; Krens, Frans A.; Jacobsen, Evert (2006). "Cisgenic plants are similar to traditionally bred plants". EMBO Reports. 7 (8): 750–753. doi:10.1038/sj.embor.7400769. PMC 1525145. PMID 16880817. Sun. "From indica and japonica splitting in common wild rice DNA to the origin and evolution of Asian cultivated rice". Agricultural Archaeology. 1998: 21–29. Thro, A.M.; Spillane, C. (1999) Biotechnology assisted participatory plant breeding: Complement or contradiction? CGIAR Program on Participatory Research and Gender Analysis, Working Document No.4, CIAT: Cali. 150pp. Deppe, Carol (2000). Breed Your Own Vegetable Varieties. Chelsea Green Publishing.